Does your charity struggle to meet its online fundraising goals? Chances are your donation form is not fully optimized to boost conversion. In this post, we’ll explain various proven tactics to boost donation form conversions. Suggesting different donation amounts is an effective way to drive more conversions. You might be wondering, shouldn’t donors be allowed to give whatever they want? Actually, most first-time donors often find it difficult to decide how much they should contribute. Chances are they’ll leave the page without making a donation. By suggesting different donation amounts, you’re helping them to choose the right donation amount easily. They may even be encouraged to donate more than they would have if left to enter an amount. In the WPForms plugin, you can suggest different donation amounts by adding payment fields to your donation form, like the Multiple Items or Dropdown Items field. Keep in mind that overwhelming your donors with too many options can make decision making difficult, in turn hurting your conversions. Make sure to give only a few choices, so your donors can easily choose the right amount to donate. According to a Nielsen study, donors want to see how the charity spends their funds before making a donation. Sadly, only 4% of nonprofit websites explained how they use donations. In order to encourage more visitors to make donations on your site, you need to explain how you’re going to spend funds. 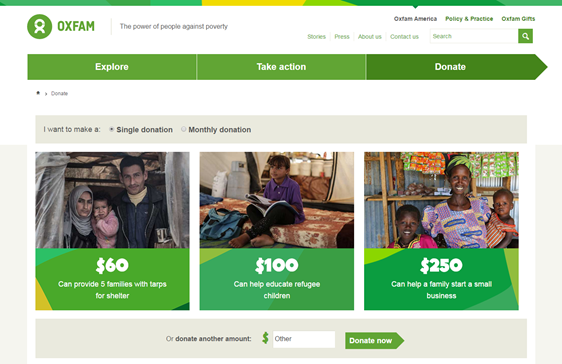 Oxfam America’s donation page is an excellent example of explaining how their donation funds are being spent. By providing these details, Oxfam America encourages donors to visualize the impact their funds could bring in, which in turn encourages them to give more when they’re donating. Surprisingly, many non-profits don’t use social media to its full potential. United Way is one organization that does know how to use social media for good. 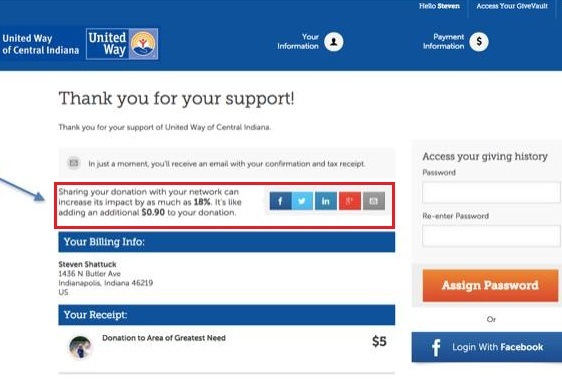 Let’s look at an example of how United Way uses social media to encourage visitors to donate more on their site. In their donation confirmation page, they entice donors to share their donation with their network. To encourage sharing, they tell their donors that each share could bring in an additional 18% of the donations they just made. One of the main benefits of this strategy is that it encourages other like-minded people in their network to think of making a donation. You can replicate this strategy by creating a donation confirmation page on your site and adding social sharing buttons to it. With WPForms, you can easily redirect users to a confirmation page after submitting the form. It’s easier to encourage donations from people who have already contributed to your cause, than to solicit new donors. Building an email list of donors is an essential task for your non-profit. Your email list will allow you to easily get in touch with your donors and stay in their minds, so they remember to donate again. To build your list, all you need to do is to connect your donation form with your email marketing tool and add a subscription checkbox to your form. This way, you can automatically add your donors to your email list. WPForms allows you to connect your donation forms with various email marketing tools such as AWeber, MailChimp, GetResponse or Campaign Monitor. “A/B testing” is a type of optimization testing that pits one version of your form against another version, to see which gives the best results. A/B testing is a surefire method to skyrocket the conversion rate of your form. By A/B testing different elements of your form, like form fields, button text, placeholder text, and more, you can analyze what works best on your site when it comes to boosting conversions. To conduct an A/B test, you’ll need to duplicate your donation form and customize its elements. In WPForms, you can duplicate a form with just a single click. For more details, you can read our guide on duplicating WordPress forms. For some ideas on how to get started with A/B testing, check out these best practices for A/B testing your website forms. By accepting donations on your site, you’re encouraging your visitors to share sensitive data like credit card information with you. You might already know that adding SSL to your site is an essential task to ensure that your donation form is secure. SSL is an industry standard security measure that creates an encrypted link between each visitor’s browser and your website. Aside from assuring your site’s security, adding SSL will also help you to increase conversions when you accept donations online. How does SSL boost conversions? After you install the SSL certificate on your site, your website address will begin with HTTPS instead of just HTTP. In addition, they can also see a small green padlock icon in the address bar. According to GlobalSign, half of your donors look for these security indicators before they make donations. They’re concerned about their data being intercepted or misused online. By adding SSL to your site, you’re telling them that their data will be kept private and secure. This can help to boost conversions when you accept donations online. For more details on getting started with SSL, check out this guide to how to add SSL to your WordPress site. That’s it! We hope this article helped you to learn some crucial tactics to boost donation form conversions. #1 & #2 are clutch, suggesting different amounts and even better… A/B testing the amounts until you conclude what has the most impact is deal. Combine that with a nice explainer page and you are making $$$$. Great article Shahzad. Thanks for your comment. I am really glad that you liked the post. You may follow us on Twitter for more tutorials like this.